On September 6th, Michigan will host Notre Dame for probably the final time, for at least a while. The event is sure to draw the same if not more attention than the previous "Under the Lights" matchup in 2011 due to the fact that Notre Dame just played for the BCS National Title, and the last two primetime matchups have provided some thrilling games for both schools. ANN ARBOR, Mich. -- The University of Michigan Athletic Department revealed the Under the Lights II logo on Monday (July 29) as well as other new information about the game. The second night game in school history will be the final time that Notre Dame plays at Michigan Stadium for the foreseeable future. The U-M Athletic Ticket Office will begin taking ticket orders for the Sept. 7 primetime game against Notre Dame starting this Tuesday, July 30. For information on eligibility and how to obtain tickets, visit http://www.mgoblue.com/tickets/fbl-index.html. Blue Cross Blue Shield of Michigan and Blue Care Network are the presenting game day sponsors for this 41st game in the storied rivalry between two of college football's winningest programs. BCBSM is helping to provide two separate giveaways to attendees: maize pom pons and LED bracelets. The athletic department has an exciting pre-game ceremony planned to honor former Wolverine and Heisman Trophy winner Tom Harmon. He will be celebrated as a Michigan Football Legend and his No. 98 jersey will be returning to the field that evening. Harmon will be featured on the ticket artwork and in a 16-page commemorative section of the game program. U-M has created a special logo with apparel provider adidas. The Under the Lights II logo will be featured on a limited amount of merchandise for sale at M Den locations or online at MDen.com. This will be the third straight primetime game played between the Wolverines and Fighting Irish. 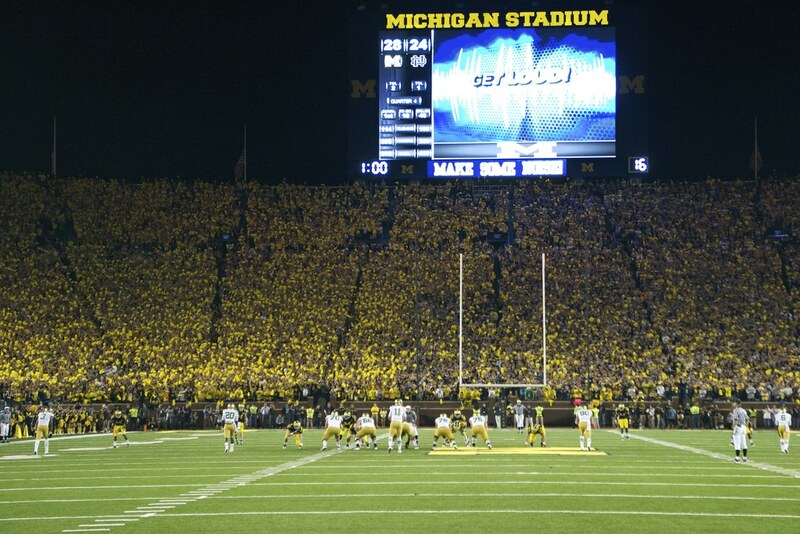 The first night game in Michigan Stadium history came against Notre Dame on Sept. 10, 2011, a 35-31 Wolverine victory on a 16-yard touchdown pass from Denard Robinson to Roy Roundtree with two seconds left in the contest. Michigan has a 23-16-1 record all-time against Notre Dame and is 12-7 at home. Stay tuned for more exciting news surrounding the night game in the coming weeks. It's going to be really odd to see a Michigan player wearing #98. Given that Harmon was an offensive star, it'll be interesting to see how Michigan handles having to, presumably, give the number to a defensive player. I don't think offensive players can wear numbers that high, no? No idea what the "more exciting news' could be. Maybe ESPN College Gameday will make an announcement? Considering this is, by far, the biggest non-conference game for the Big Ten this season, Gameday could be a real possibility. Personally, I'm sad to see the rivalry ending, especially ending the way it is...at a time when both schools are playing at higher levels than in recent years. There's more on the line now when the Wolverines and the Irish get together. It's a shame Jack Swarbrick decided to end it now. But Notre Dame is in a transition period. They're shifting to an ACC-heavy schedule. But while Michigan gets the axe, Purdue and Michigan State will remain on the Irish schedule...which doesn't make a whole lot of sense to me. Either way it's a shame to see the series coming to a close, at least for now. These last two meetings are going to be thrilling games to watch and experience.